Kids! Build an ice cream truck for free: Kids can build an ice cream truck for free at your local Lowes “Build and Grow Clinic” on Saturday from 10 a.m. to 11 a.m. Each participant receives a free apron, goggles, a project-themed patch, and a certification of merit. Registration is a must! The 23rd Annual Simi Valley Cajun & Blues Music Festival 2012: It’s a full weekend of nonstop entertainment featuring international and award winning Cajun, Creole, Blues and Zydeco music acts, food booths, crafts booths, a kids area featuring bouncers, rock walls, specialty acts, crafts and talent shows. Saturday and Sunday, 10:30 a.m.- 8 p.m. Rancho Santa Susana Community Park, 5005 Los Angeles Ave., Simi Valley. Kids under 5, free; Kids 5 – 12, $15; Adults (13 and up): $18. Simi Valley residents get a $ 3 discount at the box office with ID or online using their zip code as an access code. 39th Annual Topanga Days Fair: There will be live music on three stages, food and beverages, clothing, jewelry and art by local artisans and a variety of environmentally conscious products and services. Musical headliners include the Young Dubliners and Fishbone. Saturday, Sunday, Monday, 10 a.m. — 7 p.m., On Monday, the Memorial Day Parade starts at 9 a.m. Topanga Community Club Grounds, 1440 North Topanga Canyon Blvd. (323) 203-4844. $20, free shuttle service along Topanga. 39th Annual Valley Greek Festival: Enjoy a cultural experience for the entire family with live music, dancing, gourmet food, homemade pastries, cooking demonstrations, children’s activities, a Greek market, and a variety of shopping boutiques. This admission-free fundraiser is the largest festival of its kind in the area. Saturday, Sunday, Monday, 1 p.m. — 9 p.m., St. Nicholas Greek Orthodox Church, 9501 Balboa Blvd., Northridge. Free admission; cost for food. Topanga Vintage Market: No need to traipse out to Long Beach, Santa Monica or the Rose Bowl. It’s the second event for this specialized market featuring authentic vintage goods and collectibles with over 100 booths. This Sunday, May 27 from 8 a.m – 3 p.m. at the Westfield Promenade, and the fourth Sunday of every month. Read the My Daily Find article about their first market last month here! 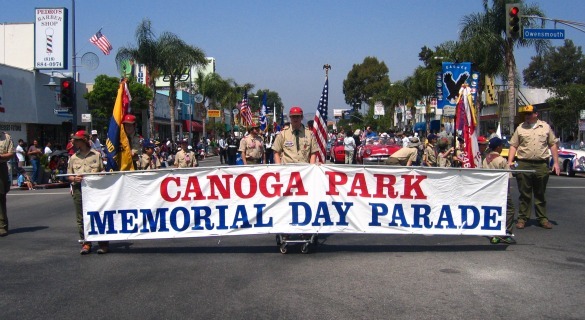 Memorial Day Parade and Festival in Canoga Park: Monday, 11 a.m. – 3 p.m. Along Sherman Way from Owensmouth Ave. to Desoto, Canoga Park. Watch the Memorial Day Parade and then enjoy a festival with food, music, and and after parade entertainment at Quimby Park in Canoga Park. Free. Free Day at LACMA: Celebrate Memorial Day on Monday from noon to 8 p.m. with FREE general admission to the permanent galleries and non-ticketed exhibitions. Enjoy a live performance by Musicantica at 12:30 and 2:45. The Los Angeles County Museum of Art (LACMA) is the largest art museum in the western United States, with a collection extending from ancient times to the present.Los Angeles County Museum of Art, 5905 Wilshire Blvd, Los Angeles. Hotel Surplus Outlet Sale Continues: Through Memorial Day, it’s a blow out parking lot, warehouse and clearance sale on furniture and accessories with discounts on prices already slashed 50%-90%. Tables, chairs, sofas, tables, lamps, drapes and more…as low as $10! Read all about it in My Daily Find. The Saturday Sale: Get downtown to the California Market Center this Saturday (and there’s clothes for men and kids too!). Peruse through such designers such as DKNY, Single, Young Fabulous & Broke, The Loom Lodge in LA, XCVI, Kay Celine, My Tribe, ZZLACA, Stiletto, Staples USA, Alberto Makali, Color Me Cotton, California Connections(jewelry & accessories), River Up (hats), Mesmerize, Christine Alexander, Doctrine Apparel, MG Concepts, Cordova Enterprise (jewelry& accessories) City Girl, David Cline, Nu Paris. 10 a.m.-3 p.m.
Hollywood Pianos Memorial Day Parking Lot Sale is happening Saturday to Monday from 10a.m.-6 p.m. Save 35%-75% on new and used pianos from concert grands to digital pianos. Find hundreds of pianos all in one place by Steinway, Estonia, Young Chang, George Steck, Samick, Albert Weber, Roland, Yamaha and more. Used uprights start at $199, Used grand pianos start at $495, New uprights start at $1995 and new grands start at $2995. Digital pianos start at $199. 1033 Hollywood Way, Burbank.